This year, God gave us a son, the second greatest gift we have received, with his own son being the greatest. Having a son of my own has given me an even deeper appreciation for Christ’s birth, life, and sacrifice. Watching Joshua while he sleeps, it’s hard to imagine sending him to die for a world of sinful people so that they could be saved. How that must have broken God’s heart, and how it breaks mine without even having witnessed it or having to do it. It’s amazing that God loves us that much. Perhaps even more than I love my little boy, which is hard to imagine. Although I don’t recognize Christmas as the day of Christ’s birth since, well, he wasn’t born on December 25th, I do celebrate it secularly and I’m hugely thankful for my Christmas gift this year. 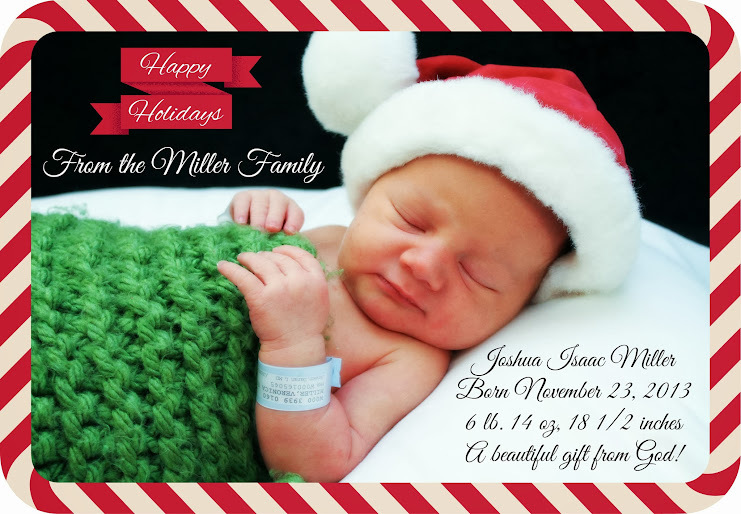 I have so much to tell you guys about Joshua’s first month, but for now I want to wish you a very happy holiday and hope that your heart is filled with love and joy and your time is spent with family and friends. May God bless you in the coming year! ” .˛.°★。˛ °.★** *★* *˛. What a SWEET NEPHEW~COUSIN we have! Merry Christmas to the Millers. Happy New Year too! I’ve been waiting to hear from you and to see how Joshua is doing. How beautiful he is. Merry Christmas to all of you. Cutie! Merry Christmas and Happy New Year to you and your family V! Feliz Noche Buena para ti y tu familia. The best for 2014. I know it is not easy being a first time mommy but I miss your blogs. Wishing you and yours a blessed Christmas and a bountiful New Year! Merry Christmas, V. Your baby is just beautiful and I’m so happy that you and Dennis are able to enjoy him together. What a lucky little fellow. Much love to you and yours. Beautiful baby. Merry christmas and a Happy NewYear to you and your family! All the best for exciting 2014! What a beautiful blessing you have received. I can tell this child’s world will be one filled with love and an adoring family to surround him. I wish you all a Merry Christmas and a very Happy and healthy New Year. The ending of one phase and the beginning of another beautiful phase. Growing in so many ways with your guidance and serious assist from God. Merry Christmas and enjoyment for the years to come with this addition and all other blessings ahead. So glad you posted a holiday pic of cutie pie! Hope (but I know you did) have a wonder Christmas. Many blessings in 2014!!!! Merry Christmas, Veronica! So glad to see a post from you. I have been thinking about you for sure and hoping that you are all doing okay. Take care. Will be watching for you around here in the blogging world! Merry Christmas love!! I absolutely couldn’t be happier for you! What a cutie pie. Merry Christmas V!! I know you had a joyful holiday what a sweetie! So happy for you he has arrived at last. Enjoy they grow too fast. Merry Christmas! I hope y’all had a wonderful holiday. Joshua is so precious!